Mark Purdey's life changed one day in 1984 when a Ministry of Agriculture inspector told him he must administer a toxic organophosphate pesticide to his dairy herd. Passionately committed to organic farming and convinced of the harmful effects of chemicals in the environment, he refused to comply. "It was as if my whole life became focused", he explained later. Before they had a chance to prosecute, Purdey took the Ministry to court and won his case. 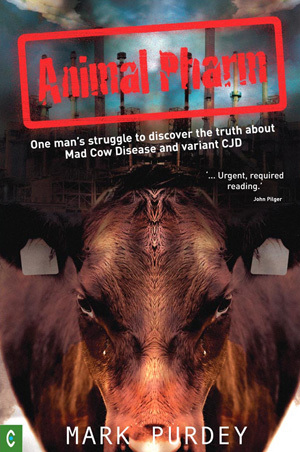 These experiences led him to challenge the orthodox line on the origins of Mad Cow Disease and its human counterpart variant CJD. Could the insecticide used in the official programme have precipitated the spread of the disease? Purdey's quest to discover the truth was hampered at every turn by government bureaucracies and self-serving scientific cliques who sought to smear and marginalize him. Dogged by dirty tricks and forced to work alone as something of a scientific sleuth, he struggled to reveal hidden interests and dangerous secrets. His supporters included many members of the public, as well as Prince Charles and the poet Ted Hughes. The latter wrote to him expressing "a million congratulations". Increasingly sceptical of the official narrative, Purdey was certain that toxic environmental factors would provide answers, and so embarked on a self-funded worldwide odyssey to investigate. Animal Pharm follows him on these eco-detective trails to locations as diverse as Iceland, Sardinia, Colorado and Australia. Purdey uncovers contamination from industry, munitions, pesticides, nuclear experiments and natural geology, linking these with the emergence of a range of neurodegenerative diseases. His research is at once compelling and disturbing, helping to create a paradigm shift in our understanding of the relationship of pollutants to disease and health. MARK PURDEY, born in 1953, turned down a university place to start his own organic farm at the age of 19. In the late 1980s he started to teach himself neurobiology and in the mid-1990s began worldwide field research to discover the truth behind BSE, CJD and other neurodegenerative diseases. He was a vociferous campaigner on these issues making TV programmes, publishing articles in peer-reviewed journals and lecturing at many prestigious institutions. He died in November 2006 of a brain tumour and is survived by his wife and eight children. NIGEL PURDEY was born in 1951 and attended the Universities of London and South Bank. He taught classical guitar for a number of years, and for the last 25 years has worked in architecture. He has had Chronic Fatigue Syndrome for 18 years and this spurred him to research its links with toxic exposure. He soon developed an interest in his brother?s work and accompanied him on several research trips, making several short films of their journeys.